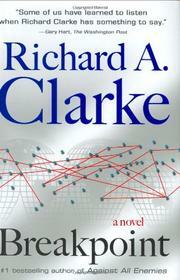 Former presidential adviser and terrorist specialist Clarke (The Scorpion's Gate, 2005, etc.) offers a lights-and-sirens futuristic techno-fantasy. Massive simultaneous beachhead and underwater explosions on Sunday, March 8, years in the future, cripple American telecommunications systems (including satellites), effectively reducing the overseas armed forces’ ability to carry potential wartime missions. The Pentagon and Homeland Security take up the alarm, dispatching two seemingly mismatched professionals to get to the bottom of this obvious terrorist strike. Jimmy Foley, an NYPD detective newly arrived in Washington, on loan to the Intelligence Analysis Center, and Susan Connor, head of IAC’s Special Projects unit, are assigned to investigate what the government believes is China’s retaliation for America’s support of Taiwan’s independence. The duo’s mission is to find out who organized the bombings of key technological systems and what they plan to strike next. The novel’s intricate narrative introduces a dizzying array of programs designed to trace international telecommunications, culminating in the supposedly flawless über-program Living Software, which would put all hackers out of business. Foley and Connor infiltrate pods of Harvard academics and Silicon Valley computer evangelists, entering a brave new world of genomics and reverse-engineering of the brain that “runs a risk of blurring what it means to be human,” Susan observes. All of this points to a creepy movement called Transhumanism, which advocates the improvement of humanity through genetic engineering. (It’s a real movement that holds regular meetings, states the Author’s Note.) Clarke has certainly done his homework, tossing off asides on the organic evolution of technological trends from robotics and nanotechnology. Some may be confounded by this international cyber-maze, which reads more like a textbook than a novel.